Note: this transcript deviates slightly from delivered remarks, for clarity. May 17, 2016 -- Let me apologize from the very beginning. This speech is longer than what I initially planned. In my 26 years, I have only written three speeches and they have all been since I’ve been Mayor. And this one just happens to be a little bit longer than I normally do, but it’s kind of hard to talk about transportation without talking into details. Let me start off by thanking Andrea and Jack, and TAG for extending the invitation to be with you this morning. And let me also compliment TAG, from the very beginning, for the outstanding work that this organization does. In fact, your presence here today signifies how important this organization is, so if you will please join me in just acknowledging them for the work that they do. Let me also acknowledge, again, all of the elected officials in this room and if I called you out name by name it would add another ten minutes to this already long speech. So let me just acknowledge everyone. I do certainly want to acknowledge individuals I notice; I see Representative Sarah Davis is here from the legislature. Good to see you Sarah, look forward to working with her from another capacity with the legislature. Thank you, she is truly a, well she is already a star legislator, but her star is still rising higher and higher. And then I do want to acknowledge these city elected officials because we are voting on the budget next week. And the lobbying on that starts, like, right now. These happen to be my most favorite of the 16 people on city council, and I asked them to join me today. So I want to acknowledge Vice Mayor Pro Tem Davis, I want to acknowledge Council Member Martin, Council Member Green, Council Member Edwards, Council Member Cisneros, and Council Member Robinson. Thank you for all being present today. As Commissioner Mosley said, I’ve been on the bus for a long, long time. From intermediate and high school all the way to going to the University of Houston, and this is a central component and I will be talking a little bit more about that. I do want to also acknowledge or single out the new metro chair, the first woman ever to chair METRO, Carrin Patman. It’s good to be with you this morning. Many of you know that I went to TxDOT in Austin recently and called for paradigm shift in how to tackle the mobility challenges of our state and our urban areas. We are not just growing out we are also growing up. Mobility is vital to our great region. The growth of our region has been a blessing. It means more jobs and economic opportunities for our residents. It also means more tax base, enabling local government to provide enhanced services and amenities, more police & fire, being able to address our infrastructure needs, parks and libraries and the list goes on. And our region’s abundant available land, which has been opened up for development by our freeways, has helped keep the region affordable. This affordability is important for the region’s competitiveness and our quality of life. We are fortunate that we have a competitive city, which means that this growth will likely continue; which is a good thing. Still, the growth projections for our region are simply daunting. The regional demographers expect 3.5 million more people in this region by 2040, for a total of 10 million people in the 8-county region. That is the equivalent of placing the entire Chicago of 2.72 million people right here in the Houston region. That’s a lot of people. So while continued growth is vital to Houston, we need to think about how to leverage this growth to create a healthy, durable region. Smart strategic decisions about mobility will be key to leveraging the growth to our advantage. That’s because mobility decisions of our public agencies – including many of the organizations and people here today – will shape our growth patterns. Land development significantly follows our transportation investments. For example, we are already seeing tremendous development activity along the recently completed sections of the Grand Parkway. A recent Harris County study estimates that by 2050, the Houston population in northwest Houston in the vicinity of US290 and the Grand Parkway will increase by over 1 million people with over 100,000 acres of land to be developed in the area. This and other examples of similar patterns in the region have demonstrated how transportation investments like our freeways influence the market and drive location decisions of our residents and businesses. And these growth patterns, and the mobility investments that drive them, will impact not just our mobility needs – but many other goals as well. That’s why we can’t simply think of our mobility decisions narrowly, in terms of congestion relief alone. Instead, we must consider how mobility decisions affect other regions as well. Flooding is a good example. Our land development patterns, influenced by our transportation investments, impact how the region drains. Our flooding risk increases as vacant lands that previously absorbed rainfall become streets and rooftops, creating more runoff. Transportation investments support a strong economy, which is dependent on efficient movement of people and goods to attract businesses and residents to the region. Air quality is also a regional concern, impacted by emissions from vehicles on our congested highways. Quality of life is another regional goal affected by transportation priorities. Good roadway design, especially in our denser urban areas, can help transport interesting streets and places where people enjoy walking and shopping, attracting visitors to our region, and serving as focal points for creating complete communities. And often times we talk about complete streets, but under my administration I am going to focus on complete communities. And even the fiscal health of our region is at stake. Our region has watched areas of low-density suburban communities expand over the recent decades, often in unincorporated areas. Many of these areas are now aging and increasingly need costly maintenance to their roads and utility infrastructure. Yet these low-density areas offer limited tax base that is vital to enable local government support for this maintenance. The potential deterioration of these areas is a regional challenge and a potential threat to our long-term fiscal health as a region. We need to better understand the significance of this challenge. All of these issues impact each other. So we should consider all of them as we formulate our transportation strategy for the future. These interrelationships were well-defined last year, when the City adopted Plan Houston as the City’s first general plan. Now it’s time, Council Member Edwards, to focus on more specific, concrete steps for implementing this Plan. Let me share some mobility strategies I believe are key to our regional success – strategies that I believe take into account all of these objectives. What is required is a true paradigm shift for the region. The first strategy is to encourage well-connected, denser urban centers. We are already a region of multiple urban centers. Some are inside our City, such as our downtown, The Medical Center, the Westchase District; others are throughout the region, such as Sugar Land or the Woodlands, or Katy or Baytown. We should also build on this model and create well-connected transit oriented development throughout the region. Having denser places with a mix of nearby uses means that you can live, work and play in proximity to this area. When you add the right mix of infrastructure and design, this means more people will be able to walk or bike, or ride transit for many of their travel needs. The density and mix of users fosters economic activity while reducing the need to get into a car for every trip, minimizing congestion. This approach also creates an opportunity for vibrant public spaces that are important for the region to be attractive and internationally competitive. From a regional perspective, we can then connect the centers together with strong multi-modal investments, especially transit, further reducing vehicle trips in the region. How can we do this? From the public sector, we should prioritize our mobility investments to strengthen existing and new centers. We need to focus our limited funding in these areas, where mobility demands are highest and the opportunities to create a sustainable regional strategy is greatest. A good example of this is the City’s proposed dedicated bus lanes on Post Oak Blvd. This project significantly enhances convenient access into the Uptown area for residents across a broad sector of Houston, supporting the economic development of this area without requiring use of a car. But public agencies can do more than just prioritizing mobility improvements. Our growth and development tools should also be used encourage activity centers. The City of Houston has already done this. In 2009, the City passed a Transit Corridor Ordinance, which encourages compact, pedestrian friendly development along METRO’s light rail lines. The City of Houston and other agencies should continue to find other creative ways to coordinate land development with mobility investments. I challenge the private development community to also take advantage of this centers approach. Well-designed developments that enable a denser, walkable environment is good business. The popular City Centre development in west Houston is a good example of a successful development project that follows this model and creates an enjoyable community asset. Other promising developments are on the horizon. The City stands ready to coordinate with developers who wish to follow this approach. The second strategy is using a multi-modal approach to providing for mobility needs. Historically, this region’s primary transportation strategy focused on moving single occupant vehicles. We have continued to add capacity to freeways and roadways. According to the Federal Highway Administration, in 2014 Houston ranked 5th in the nation’s urban areas for the number of roadway miles per person. That was fifth. Yet all this construction has not significantly reduced our congestion. Indeed, more roads have led to people driving more. The Katy Freeway is an excellent example. The region spent over $2 billion dollars on the Katy Freeway expansion. This project was completed in 2008, making the Katy Freeway one of the widest freeways in the world. Yet, only 7 years later, I-10 near Beltway 8 ranked as the 8th most congested freeway in state of Texas. These roads create a significant challenge in terms of future maintenance costs. The city is already suffering from years of deferred roadway maintenance and underinvestment. The City’s recent pothole initiative is only a temporary fix, it is in need of a long-solution. In some cases, adding capacity actually detracts from quality of life. Our core urban areas have vibrant, enjoyable areas where walkability should be prioritized, in some cases even over an automobile. And widening streets can make the streets less appealing as a pedestrian. Houston’s Lower Westheimer area is a great example. This historic Montrose area is already compact and walkable, full of restaurants and street life, and is a treasured part of Houston’s eclectic culture. The City should build on the strengths of this unique area by improving Lower Westheimer to enhance pedestrian activity and support the small businesses and the local neighborhood. Clearly, we need a better way to efficiently move people. We need to move more people and commerce on existing infrastructure. The solution is to increasingly take advantage of other modes of travel to move people on existing roadways. This is one of the strategies that we need to employ for these areas that are much more dense. The city is already doing this in some respects. In 2013, the City formally embraced, via Mayor Parker’s executive order, through the creation of the Houston Complete Streets and Transportation Plan, a complete street approach to mobility. The City’s Public Works & Engineering Department is fully implementing this philosophy, by looking at potential need for each travel mode for all street reconstruction projects. Some of these projects are now in design, but this doesn’t mean we put a bike lane on every street. However, it does mean we strategically consider the potential need for bicycle and other modes for every project – not just moving cars. METRO’s High Occupancy Vehicle (HOV) lanes are another great example of a successful multi-modal approach in Houston. This is a highly popular and effective system, connecting regional residential areas and employment centers with frequent, convenient service. Last year, METRO had over 26 million riders on the HOV system, with over 100 miles of HOV lanes on 5 major corridors. We should look at the future of this system. The old model was primarily one of residential trips from suburban areas coming into employment centers in the urban core. But the region has also seen growth of jobs/destinations in suburbs, and additional residential inside the 610 loop. That’s why we need 2-way HOV lanes on all freeways. These growth patterns warrant frequent and reliable 2-way systems. It enables 2-way bus rapid transit on HOVs. We should consider HOV lanes on loop facilities as well, including Beltway 8 when reconstructed. I encourage the HC Toll Road Authority to think creatively about these opportunities. And these same strategies – encouraging shared vehicle trips of all kinds – must be used on not just freeways, but also urban street grids – and the two must be well coordinated. The street grid in the inner core must distribute these trips coming off of the freeways. The 2010 census shows that the COH’s daytime population increases by 577,000 daytime commuters, Monday through Friday, that’s a 27% increase. That is greater than the population of the city of Atlanta. So every single day people coming from outside into the City of Houston increase our population by adding another Atlanta. Plus, Houston itself is becoming denser in our urban core. We must keep the urban core moving so that our residents can access jobs and other amenities. That is why finding ways to encourage shared trips on vehicles is critical to the vitality of the region. Transit and carpooling improves access to jobs and services. The bus system will be backbone for moving more people quickly on limited street right of ways. METRO must be commended for their System Reimagining project. This innovative effort made the bus system more efficient with minimal additional resources. The system has more frequent bus routes, 7 days a week. This year, METRO’s system-wide ridership, including both bus and rail, is up over 8%, and now has over 320,000 passengers boarding per day for all modes: local bus, park & ride, rail, HOV/HOT lanes, vanpool, and METRO Lift. But what is next phase for METRO? I’ll leave that, in part, to the new Chairperson and the board. How can we further use buses to move people quickly and reliably? I am pleased to have appointed Carrin Patman, who I know will bring visionary and innovative leadership to this agency. Express bus and bus rapid transit is one strategy we should explore, enabling faster longer-distance travel on some corridors. This is similar to METRO’s Quickline, a signature bus service on Bellaire, providing faster service with less frequent stops. Additional opportunities to optimize the bus system should be explored by implementing better technology and design on the City’s roadways. The City stands ready to coordinate with METRO to identify opportunities to move buses quickly on City streets. Some traffic signals may need to be coordinated with buses to encourage faster mass transit, offering travel time advantages for bus travel. As we get denser and our mobility needs growth, we will have to make choices on how to use limited space on streets to move more people faster. Some areas of our city now have the right density and mix of uses where these types of enhanced bus transit services are an opportunity to move more people quickly on our streets. Westheimer, outside the loop, is a good example. More long-range transit planning is needed to identify these opportunities. METRO has not updated their long-range capital plan since 2003 when the METRO Solutions Plan was adopted. I urge METRO to update it, and City will be your partner. We must also look to change culture of riding buses in Houston. Many people look at transit as only for the poor or hipsters. Did I use that term? I may be old in numbers, but I am still young in heart. But if we are to provide for our mobility needs, yet maintain quality of life, transit must become an option that appeals to a wide spectrum of individuals. As existing riders know, transit already allows for productive or relaxing time for other things. Buses are increasingly frequent and convenient. Improving travel time competitiveness for buses and other transit will be critical and crucial to increasing ridership. The light rail system, now 3 lines, holds promise in urban core for moving people and spurring private investment. The Main Street, the Red Line, has more boarding per mile than any other light rail system outside of San Francisco and Boston. The extension of light rail down the US90A corridor, as originally envisioned in METRO’s 2003 plan, continues to be a promising opportunity to provide a convenient connection between southwest Houston, and the Texas Medical Center, and downtown Houston. We know that this project has significant right of way challenges and will require strong coordination with Union Pacific Railroad, who owns the adjacent right of way. Still, the region should continue to explore this project, and I’m pleased that Congressman Culberson has pledged his support for this evaluation. We need convenient transit connections from our urban centers to the region’s major airports as well. Express bus, or even light rail, has potential for this connection and should also be evaluated. 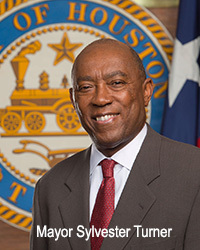 But I have made it very clear that as Mayor of the City of Houston even as it relates to light rail, that I will not force light rail on any community that does not want it. I will not do it, but I will encourage that we place light rail in communities and neighborhoods that do want it. Rail, we must stop trying to force it on places that do not want it, and give it to neighborhoods and people in this City that do want it. And in time, those who don’t have it or who were opposed, in time, they will recognize that they need to get onboard. But I will not try to force a fit. Commuter rail, using heavier train technology, is another option to provide a high capacity, longer distance transit from the suburban areas further out in the region. This option has significant cost, but as needs increase, it should be looked at closely. And we should support high speed Houston/Dallas passenger rail. Now notice, I said, high speed Houston/Dallas passenger rail. As much as I like Dallas, it’s not Dallas/Houston it is Houston/Dallas. We are the fourth largest city, soon to be the third, the most diverse. Houston must stop being second to any other city in the state or in this country and be who we are. I support it. I believe that this high speed train coming from Houston to Dallas or Dallas to Houston will add another signature moment for this state and this region. It is also futuristic. This is a huge opportunity to improve Texas economy, enhance mobility, and create Transit Oriented Developments (TOD). It offers potential for traveling between Houston and Dallas in under 90 minutes. This City is coordinating closely with private company Texas Central Partners to help make this a reality. I know it will not be easy. I know there are a lot of small towns, between the two, that may not want it, but I hope we will do everything we can to advance it, because it will not only benefit these two regions it will benefit the state of Texas as a whole. And, we will do everything we can to find the suitable and best stop for the train. Whether it is in downtown or the northwest transit station, but it certainly needs to be in the City of Houston. Then there are other options as well. I’ve talked about a lot about bicycles and hike and bike trails, we are moving aggressively in that direction. And we need to build a city that is more walkable, pedestrian friendly, and we don’t start building that design tomorrow. We need to start doing that right now. In the 1990s we made some decisions that are impacting us today. We will always have roadway capacity in this stat. That will not change. But we should not limit ourselves just to roadway capacity. It must be multi-modaling concept or we lose our competitive edge. The third strategy is to continue to improve the efficiency and safety of systems that move the region’s freight and goods. And I certainly want to acknowledge the County Judge Ed Emmett, for doing an outstanding job in leading the study in this particular area. The freight movement is vital for the region’s economic health. The Port of Houston has been ranked second in the US in total tonnage for 23 consecutive years, and consistently ranks 1st in foreign waterborne tonnage, 1st in US imports, and 1st in US export tonnage. A key part of freight movement is the region’s railroad network. Our railways laid the foundation for our economic strength. This system also helps relieve congestion overall, by reducing the number of trucks on our roadways. Still, the freight rail system is now surrounded by fully developed communities, especially in the urban core. This leads to a number of challenges for our community. Too often, trains end up blocking our roadway crossings, frustrating commuters. Train horn noise affects quality of life in our neighborhoods. And the railroads themselves have own capacity limitations, reducing the efficiency of freight movement and inhibiting our economy. Several strategies will help address these challenges. More grade separated rail crossings are needed, especially in our urban core. Overpasses and underpasses help unclog our mobility arteries by allowing efficient movement of people while trains cross roadways. Adding freight rail capacity can also help move trains through our region more quickly, reducing conflicts with our roadways. And quiet zone improvements help reduce train horn noise in nearby neighborhoods, allowing residents to sleep well at night. The private rail companies should be our partner in implementing these strategies. Building an overpass does more than simply benefit the commuter, but also greatly benefits private rail companies by reducing liability costs and relieving pressure from the community that is ultimately their customer. Rail companies must be at the table in helping to fund these improvements. The City stands ready to partner with all railroads to improve the system for all users. You can’t have all these good things, and expect to come without a cost. The next approach, I simply want to highlight, is to be more strategic in pursuing mobility funding. We need funding to implement the strategies I’ve highlighted. I appreciate the beneficial role of groups like TAG, the Transportation Advocacy Group. Funding has been shrinking in this state. Funding for highways, such as the State Gas Tax, last raised 25 years ago in 1991, is now at 20 cents a gallon. The Federal Gas Tax, last raised 23 years ago in 1993, is now 18.4 cents a gallon. The gas taxes have not been indexed for inflation. More fuel efficient vehicles results in shrinking gas tax revenue per vehicle. The Motor Vehicle Registration Fees, between $40 and $60/year, last raised 31 years ago in 1985. Texans pay less in transportation fees than residents of 43 other states. We need to identify ways to increase public funding. States should allow local funding options. If the state will not increase gas tax or index to inflation, the state should at least allow citizens to utilize other options to fund transportation improvements. But we need to look beyond just “how much funding,” we also need to focus on the structure of funding. The funding needs to have more flexibility. We need the state and the federal funding to allow for not just roadway capacity, but needs flexibility to also support other travel modes. The state’s Proposition funding, such as the Propositions 1 and 7, in 2014 and 2015 respectively, were generally limited to roadway improvements. This limits the flexibility the region needs to fund improvements for other transportation modes. In the last two elections, in both of these propositions, strong support came from the urban centers like Dallas and Houston. But I can also recall, during that last legislative session, at about 2:00 am in the morning there was an amendment to restrict TxDOT just to roadway capacity alone. The urban cities throughout the state like Dallas, San Antonio, Fort Worth, and Houston fought that amendment off and we killed that amendment, with the understanding that TxDOT must now be consistent with the new day, and that we cannot just focus on road construction. We need to look at multi-modal, and the sooner the cities get together and recognize that there are more people in these urban centers and the funding that’s appropriated must benefit the urban centers the better off we will all be. It does no good for propositions to come up and people in Houston and Dallas vote overwhelmingly for them, but we are also limiting the flexibility of the use of those dollars. We saw on one hand a good thing but on the other hand we were not futuristic in our thinking. Because when it comes now to the allocation of those dollars we are losing out; even though most of the votes came from Houston, Dallas, and other major areas. Same thing applies to Federal legislation. We need more flexibility. Our priorities for highway funding must be revisited as well. As we spend highway funding, we should prioritize fixing what we have first, rather than adding more. Where new highway capacity is needed, it should address existing congestion, rather than new or wider roads for purposes of encouraging land development. We must focus highway investments in urban core where connectivity needs and congestion strains are the greatest. Finally, I believe the private sector should also be looked at for helping to fund transportation projects and many mobility improvements directly enhance the private interests. My fifth and final suggestion is enhanced coordination and partnership of regional agencies. There are many agencies that work together to provide for the mobility needs of our community: the City, TxDOT, METRO, County, Gulf Coast Rail District, and the Port of Houston. And I certainly want to acknowledge TxDOT, because Quincy Allen has just been a big and huge partner with the City of Houston and Public Works. And I want you to know that I am very appreciative and very thankful. At the same time I don’t want to beat up on them too bad when I need their help. I’m not crazy. So TxDOT does excellent work, Commissioner. We just need more of the funding in the Houston region. And these agencies already coordinate extensively. But we should expand this collaboration. Our users expect a seamless system that works together. That means when one agency makes improvements, it should consider how these improvements affect the systems of the others. We should consult with each other early and often. And lastly, the example is with I-45. That’s a major project, the rerouting of I-45 around downtown Houston. That’s going to require a great deal of collaboration. Again, I want to thank Quincy and TxDot and Quincy for working with Public Works in this project. That project stands to cost six billion dollars; when the expanding of 1-10 was right at two billion. The opportunities from that project are endless and I hope we will move forward on that in a very positive fashion. In conclusion, these are my thoughts and I believe working collaboratively and together they will serve us well. Working together we accomplish more than going alone. But we must be dedicated and act with conviction and in unison to achieve our objectives. What I am describing is a true paradigm shift for the region, but we must embrace it fully to ensure the Houston region sustains its place as a healthy and globally competitive city. We all have obligation to think of those who will live and work here after we are gone. We will not be here forever, but the critical question is what sort of transportation network will we leave for the future. Or ten years from now, or twenty years from now, will they be dealing with the same issues that we are dealing with today? I do not intend to run for another office when I leave this office of being Mayor, and I am fully committed to making sure we do all that we can; that we do not repeat the mistakes of the past; that we build a transportation network that will meet the economics interest of the people that exists in our region; that we provided a system that can move people efficiently and effectively from point A to point B; that we are futuristic in our approach, and that we are not bound or limited by the natural resources. It would take bold leadership to ask people to do more, to pay more, to give more. But you cannot have more, if you are not willing to do more and pay more. Our region depends on the decisions we make today and tomorrow. And so let us go boldly into the future, and let us recognize that we are not just competing with Dallas, we are competing with cities across the globe. Let’s build a transportation network, that when they get off the plane and reach our destination, they can move from point A to point B. And they recognize that in this city, and in this region, we not just thinking about today we are thinking and acting on tomorrow. If we do it together Houston, and the Houston region, can lead the way. I look forward to working with you and making that happen.